Each participant plays the role of a firm that must make decisions about inputs to be used in production. One input, selected in advance, generates a sunk cost, and a second input determines variable costs. Participants are placed in a competitive environment that satisfies incentive compatibility conditions for accurate cost revelation (proxy bidding with an exogenous "market price"). 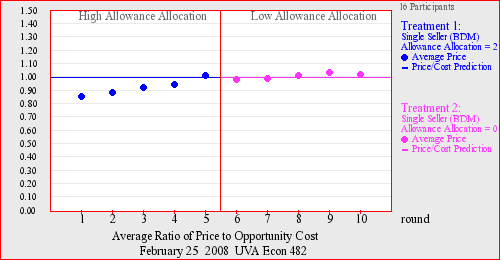 The optimal supply decisions depend on whether the fixed entry cost is a sunk cost that is automatically incurred, or whether it is an avoibable fixed cost, which serves to limit supply to the range of marginal cost above minimum average total cost.